Photo courtesy of the Australian Academy of Science. Andrewartha ultimately became the most influential Australian ecologist of the twentieth century. At a time when most ecologists worldwide were championing density-dependent forces as the likely main controlling influences on population regulation, Andrewartha broke with the mold by providing both laboratory and field evidence that density-independent factors such as weather were in at least some instances even more important. 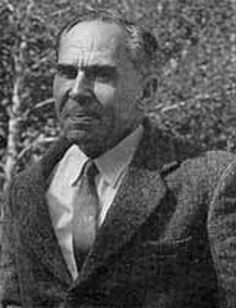 Andrewartha began his studies on Thrips imaginis, the apple thrips, in 1933. But in 1935, on moving to Adelaide, he was asked to look into another problem species, the plague grasshopper, Austroicetes cruciata. In 1945 his mentor James Davidson died, and Andrewartha inherited fifteen years of data the latter had collected on thrips populations. Statistical analysis of these data consumed Andrewartha and a former student of his, L. C. Birch, for several years, but eventually they were able to demonstrate strong connections between physiology, population levels, and various environmental factors, and this led to the publication of The Distribution and Abundance of Animals, one of the century's great titles in ecology, in 1954. Through this work Andrewartha and Birch became the founders of a second school of population ecology; this approach emphasized the role of environmental controls on populations, whereas opponents (such as their countryman A. J. Nicholson) advocated a community-based approach based largely on density-dependent control mechanisms. The debate continues to this day. In addition to his groundbreaking research Andrewartha became an important teacher and educator; he was known as a man of strongly held principles (including left-wing political leanings), and as a conservationist of some note (e.g., he was President of the Nature Conservation Society of South Australia for six years). Beyond the awards listed below, Andrewartha was the recipient of the David Syme Prize of the University of Melbourne, the Verco medal of the Royal Society of South Australia, and the Clarke medal of the Royal Society of New South Wales. --born in Perth, Australia, on 21 December 1907. --dies at Adelaide on 27 January 1992. --Historical Records of Australian Science, Vol. 9(3) (1993). Copyright 2007 by Charles H. Smith. All rights reserved.